"In the past, conventional hydraulic oils often contained zinc dithiophosphate (ZDDP) protecting them from wear and corrosion and acting as an antioxidant. Since this component has now been classified as harmful, users have turned to zinc-free oils. The reduction in the amount of organometallic additives such as ZDDP lowers the conductivity of oil. Therefore, the elimination of this additive, e.g. in environment-friendly oil, reduces the conductivity and increases the risk of electrostatic charging. If a non- or low-conductive hydraulic oil flows through a system, an electrostatic charge can be generated at the interfaces between oil and non-conductive surfaces such as filter fleece and hoses. This charge is generated by the rapid separation of two non-conductive surfaces. Filter elements have a large non-conductive surface, and charge build-up increases with increasing flow velocity of the oil. As soon as the charge quantity is large enough, discharges occur in the form of sparkovers. Conventional filter material could be locally destroyed by discharge flashes and associated high temperatures. This results in holes through which dirt particles can pass unfiltered. This leads to increased wear of hydraulic components and later to malfunctions and to the failure of the machine. However, the high temperatures of the discharge flashes also contribute to an accelerated oil aging, thus to a deterioration of oil properties and to the shortening of the oil life. Oil aging-related byproducts additionally reduce the service life of the filter elements. Also adjacent electronic components can be damaged due to electrical discharges. To avoid such problems, the charges must be balanced. For this purpose, a special filter element design was developed, which ensures charge balancing and prevents destructive discharge flashes. 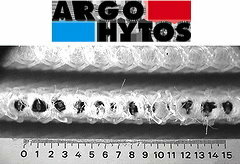 Glass fibers in a filter element are themselves not conductive, but, as already mentioned, the inner supporting meshes and the outer protective mesh are made of metal." 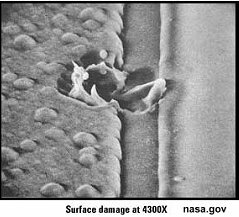 The semiconductor industry has gone through a long, tedious, and very expensive process of learning about and protecting against the damage caused when electrostatic charges drain through gate regions or, in extreme cases, across insulator boundaries. It is safe to say that the issue has been pretty much resolved through a combination of semiconductor device construction with on-chip protection, packing changes, and establishing proper handling procedures in the factory. The main risk these days is an ESD event occurring at the point of use of the end product in which the IC is contained. Who knew that a field as unassociated with semiconductor electronics as hydraulic filters is would be experiencing the same ESD challenges? As with electronics, the problem only really began to manifest itself once the scale of critical features began shrinking in size. For ICs it was gate thickness; for hydraulics it was filter hole sizes. Note: You, too, can receive a free copy of NASA Tech Briefs in the mail if you qualify (which typically means you have a pulse). BTW, for those of you not around in the 1970s, the "not just for semiconductors anymore" line was borrowed from the Florida orange juice industry's "It isn't just for breakfast anymore" commercials.